(16/P8) TRENTON – The New Jersey State Forest Fire Service advises residents that its seasonal prescribed burning program – which reduces wildfire risks by burning buildup of undergrowth, fallen trees and branches, leaves and other debris on forest floors – is now under way. These burns are generally conducted during the mid- to late-winter months to minimize the amount of smoke produced, and when weather conditions tend to be safer for controlled fires. Residents near areas where controlled burns are taking place can expect to see large plumes of smoke. Prescribed burns, also known as controlled burns, help reduce forest fire risks prior to entering the prime wildfire season, which in New Jersey generally begins in the early spring, when leaves and debris are abundant, tree cover is sparse, and conditions tend to be dry and windy. Most of these burns will occur on state-owned property, such as state forests and wildlife management areas, as well as other public lands. Prescribed burns are scheduled for today in the Pinelands of eastern Burlington County; Double Trouble State Park in Ocean County; and several state-owned Wildlife Management Areas in Cumberland County, including parts of Commercial Township, Fairfield Township and Millville. Prescribed burns are carried out by highly trained and experienced firefighters under precise weather conditions and with the necessary support equipment. Roads in areas where burns are taking place are clearly marked. Motorists traveling through these areas are advised to observe posted precautions and slow down. These burns help keep forest ecosystems healthy by improving habitat for wildlife, managing competing species of plants and trees, controlling insects and disease, and recycling important nutrients into the soil. The Forest Fire Service, part of the DEP’s Division of Parks and Forestry, expects to burn between 10,000 and 20,000 acres of forests and grasslands this season, depending on weather conditions. 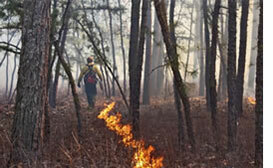 These prescribed fires do not reach the canopy of the forest or cause significant loss of mature trees as wildfires do. 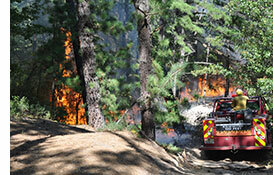 During the burns, firefighters employ best management practices to control smoke impacts but nearby residents and forest visitors should expect temporary smoke in the vicinity of any prescribed fire activity. NOTE: Media interested in seeing prescribed burns in action and talking to experts from the New Jersey Forest Fire Service can make arrangements through the DEP’s Press Office at the numbers above.